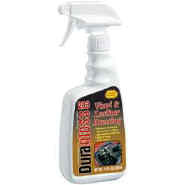 Duragloss® Vinyl & Leather Dressing puts back the luster, while softening any vinyl or leather finish. It penetrates quickly and leaves no greasy residue behind. Its special fragrance leaves the vehicle's interior smelling clean and fresh scent, too.